The vendor landscape of the global market for dimethyl carbonate is highly fragmented and largely competitive. A number of small and large companies operate in the market; obtaining licenses and certificated to set up manufacturing plants has become an uphill task in several regions and costs of catalysts are rising high. All these factors could make the market tougher for small players in the next few years, observes Transparency Market Research in a recent report. Also, restrictions in executing advanced technologies to synthesize the desirable grade of dimethyl carbonate could also present challenges ahead of companies operating in the global dimethyl carbonate market. Some of the leading players in the market are Tokyo Chemical Industry Co., Ltd. (TCI), HaiKe Chemical Group, Tongling Jintai Chemical Industrial Co., Ltd., Arrow Chemical Group Corporation, UBE Industries Limited, and Alfa Aesar. 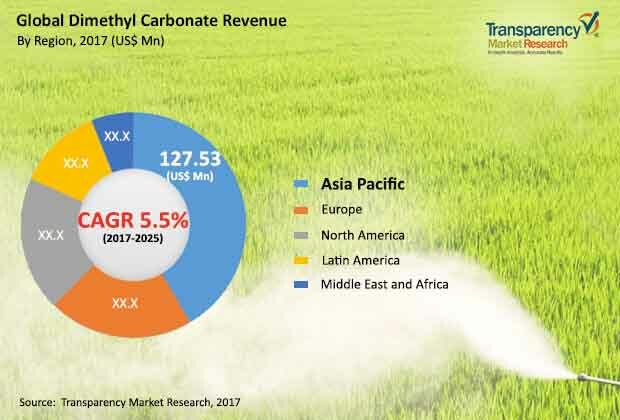 The report states that the global dimethyl carbonate market was valued at US$345.9 mn in 2016 and is projected to rise to an opportunity of US$553.3 mn by 2025 at a CAGR of 5.5% from 2017 to 2025. Of the key applications of dimethyl carbonate, the segment of polycarbonate, denoting the usage of dimethyl carbonate as a precursor in the production of polycarbonate, is presently the most lucrative and accounts for the dominant share in the global market. The segment is expected to remain a key consumer of dimethyl carbonate over the next few years as well, thanks to the increased usage of polycarbonates in areas such as optical media, electronics, and automotive. In terms of both volume and value, the market for dimethyl carbonate in Asia Pacific accounted for the dominant share in the global dimethyl carbonate market in 2016. The regional market is likely to remain dominant during the forecast period as well, with China being the key contributor of revenue as well as growth opportunities. The presence of a large number of manufacturing facilities spanning several key end-use industries for dimethyl carbonate makes China a leading consumer of the product. The thriving expansion of some of the key end-use industries of dimethyl carbonate is one of the key factors leading to the steady rise in demand and consumption of this organic compound. Manufacturers are also increasingly preferring dimethyl carbonate as a solvent over other toxic reagents such as phosgene. The usage of dimethyl carbonate in the production of antibiotics, such as ciprofloxacin and carbadox, and pesticides has also witnessed steady expansion in the recent years and these applications continue to remain lucrative for the market. It is estimated that the global dimethyl carbonate market will massively benefit from the vast surge in uptake of electronics and passenger vehicles, especially across Asia Pacific. The increasing usage of the compound in these products will prove to be highly lucrative for the global dimethyl carbonate market in the longer run. Additionally, the market will likely benefit from the increasing demand from the paints and coatings industry. The thriving construction industry in regions such as the Middle East and Africa and Asia Pacific is expected to drive the regional paints and coatings markets, which will, in turn, propel the growth of this market.